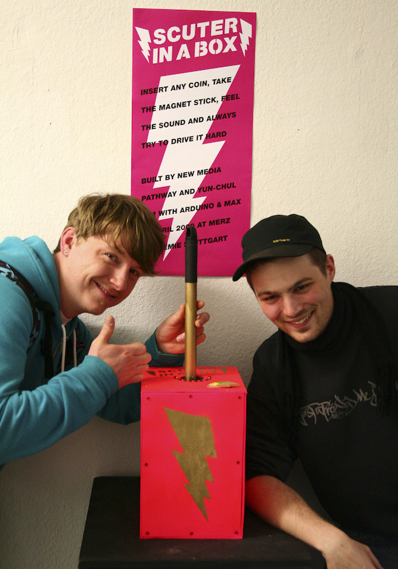 SCOOTER IN A BOX is an interactive box with a magnet stick. SCOOTER IN A BOX makes the music tangible. Based on Arduino, Max and the special physical attributes of magnet and inductor, SCOOTER IN A BOX lets you not only hear the music, but additionally lets you feel it via the magnet stick. If you want to use SCOOTER IN A BOX, you have to insert any coin and then you have about 3 minutes to glory in a randomly selected song of a famous boom boom producing formation. SCOOTER IN A BOX is the result of a project week, led by media artist Yunchul Kim in spring 2009.